Preserve your factory carpet and give your vehicle a fresh look! Covercraft Premier Custom Floor Mats have two main duties – to preserve the original carpet in your vehicle, and to enhance the overall appearance of your car’s interior. And believe us, they fit the bill admirably. Available in two different designs, Plush and Berber, Covercraft Premier Custom Floor Mats have an option for whatever your preference. 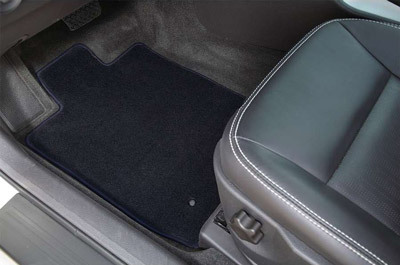 Either way, Covercraft Premier Custom Floor Mats bring a much-needed solution to your car’s interior carpet questions. Covercraft Premier Berber Custom Floor Mats take that old and worn looking interior and turn them into a new experience and feel. Bring your favorite Berber carpet design from your home, and spice up your car’s interior! The durable fabric features a 42 oz. face weight, heavy-duty 80 oz. nibbed backing, and a total weight of 122 osy. Your car’s interior sees a lot in its day – make sure it looks its best with Covercraft Premier Berber Custom Floor Mats. 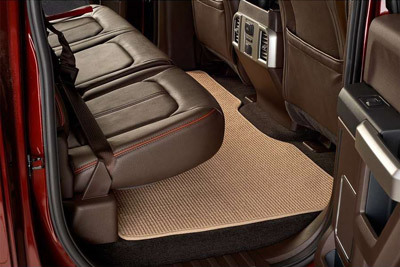 Covercraft Premier Plush Custom Floor Mats are constructed of thick nylon carpeting with cloth trim. The edging on each mat is precision stitched to provide added protection against wear and tear. Covercraft Premier Plush Custom Floor Mats also feature rubberized, nibbed backing and pre-installed security grommets on front mats that are factory equipped with them. These features hold the mats in place, ensuring that the area underneath them stays protected. The wide variety of configurations provides protection in the front and rear of your vehicle as well as the trunk and cargo area—that means that Covercraft Premier Plush Custom Floor Mats have nearly every car, truck, van, and SUV covered! Each respective configuration is totally customizable, allowing you to add names, monograms, and logos, and each come in a variety of colors. Pick your favorite Covercraft Premier Floor Mat below and bring life back to your car’s interior! Covercraft Premier Plush Custom Floor Mats protect your factory carpet and enhances the overall appearance! Covercraft Premier Berber Custom Floor Mats are available in 5 colors, as listed above. 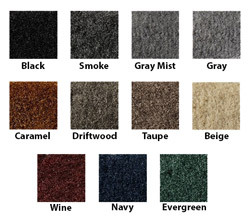 Covercraft Premier Plush Custom Floor Mats are available in 11 colors, as listed above.